I’m going to be honest, the Wishlist on Amazon.com is probably THE biggest feature they have. And as it turns out this is the most difficult feature to find anywhere else to any sort of decency. I actually was surprised at how difficult it was to find an alternative, and even what I landed on, I’m not particularly happy with. What I wanted from a wishlist site was the ability to add from any source, preferably a search function so that I didn’t have to go to websites to add it, and an image of each item on the list. On top of that, I also wanted the ability for guests to mark it for removal without having the guest log in and without the owner getting notified. I wanted the site to do price comparisons of various online stores to list the best price available. And I wanted the ability to make categories and subcategories. This was a lot to ask for, and I only got a fraction of it. One of the predominant issues with almost every site was that you really couldn’t allow a guest to mark an item as purchased, and even if they allowed that, the guest would have to sign up to the random site which I also wasn’t fond of. There were also issues with sites not allowing multiple wishlists (this seemed ridiculous to me). And no site had the ability to price check various websites. Some sites also required you to manually upload pictures which just wasn’t cool either. The site I landed on to do my wishlists was Pinterest. I know, it took me a week or two of research to land on Pinterest?!?! Well yeah. Pinterest isn’t a great option either. But it is super easy to add stuff to lists, it’s easy to make subcategories on the list, it’s easy for random others to view the list, and you can also create private lists which only friends and family can view. It has no pricing capability what so ever and no ability for people to mark things as done, but these were things not many sites had anyway. And let’s be honest, the last one isn’t something Amazon has either. They don’t even price compare on their own site. They only tell you the price of the item you selected, so if that item is listed multiple times, the other versions will be completely ignored. I did have a moment where I decided to look up who exactly owns Pinterest. I thought at some point someone may have bought the company out, and thought that company was Facebook. But as it turns out Pinterest is privately owned, I think I was thinking of Instagram. So know that if you buy into Pinterest, you aren’t giving your data to a different big company, they are their own thing. If you decide to take up Pinterest as a wishlist software (which I don’t think I’m the only one who does this), I would strongly recommend downloading their browser extension that throws the pinterest logo on every image for easy adding. This makes it so that you can go to a store and peruse and be like “I want that” just as easily as you could peruse Amazon, except now your choices can be anywhere on the net, not just on the juggernaut. Let’s get the ball rolling in this by talking about the easy ones and get those out of the. Because there are certainly some Amazon alternatives that are glaringly obvious. Hulu, I feel, is a strong compliment to Netflix, though their advertisements on a paid service continues to bamboozle me. Still, they tend to pick up most shows off most networks, both old and new. They partner with NBC, ABC, and Fox, so there’s just a lot there. Like Amazon, their originals are fairly weak overall, even with the Handmaid’s Tale. And also like Amazon, they do offer add-ons like Showtime or HBO or even live TV. If you absolutely must have HBO shows, HBO Go is out there. I don’t suggest it though. They have great originals and a good backlog, but the cost for what you get is actually quite terrible compared to the other 3. I would also be remiss if I didn’t mention that, if you don’t mind ads, a lot of networks now just put their current stuff out on their websites for free. For instance, you can watch The Daily Show and South Park on Comedy Central’s website, or The Flash on The CW’s website. It’s actually surprising how much is free out there these days. Perhaps the one area of Amazon Video that is more difficult to cut out is Twitch. If you don’t watch Video Game Streams, then this isn’t a problem. But I do, so it is. Twitch is a juggernaut in the streaming realm, and they get stronger every year. And truthfully, I don’t have a great solution to it because of things like Overwatch League being exclusive to Twitch. But I’ll give it a go all the same. My overall suggestion on replacement is to use Mixer.com instead. Why? First, I do think they are trying to come up with ways to innovate the streaming space in positive ways, and for the most part it works. They have low latency, their recent addition of paying out streamers for certain levels of “sparks” earning gives a solid way for streamers to monetize without costing viewers a dime works a lot better than anything Twitch has, and the interactivity can be pretty cool if used correctly. They also do A LOT to help streamers get noticed, they have several channels that randomly host, they feature smaller channels, and they even have an “up and coming” section. These are great for newbs. Youtube also has been trying to enter the streaming space. And they also have low latency. I think they tend to give preference to live streams in search results too which helps. But, it is ridiculously difficult now to get and maintain partnerships as a new streamer, and they have fewer avenues of monetization even if you get there. Their interface is also just terrible. Pretty much the only place that it is easy to find just random streams is by using there gaming app. Which is VERY specific and not overly casual friendly, especially if you are on the PC. I rate their interface as a whole similar to Amazon Video’s… a lot of clutter and hard to find what you are looking for. Odd for a search engine company that prides itself in its simple interface. Mixer has flaws though which stop it from being better than Twitch in the first place. One, it just doesn’t have the traffic. That is not just viewers, that is streamers as well. They are kind of in a paradox here though, they can’t get viewers because they can’t get streamers because they can’t get viewers. It’s hard to be in that position. It also doesn’t have the plug-in support or the clear path to Partner that Twitch has. Twitch also has more avenues to earning money (bit purchasing and ties to amazon come to mind). Also, for some reason, the only way you can watch Mixer on TV is via Xbox One. No app that supports Roku, Fire Stick, or Chromecast. No app on PS4 or Swtich. It’s odd. Still, as weird as it is to say… Mixer is the clear underdog. And I say that is weird because it’s Microsoft. The company that got the title of stock worth the most back from Apple. But in the competition of Google vs Amazon vs Microsoft… Microsoft feels like the clear underdog to me. And I want to support underdogs where it is worth it and I think Mixer has a lot going for it. As an aside. I recently started Streaming on Mixer. So head on over to www.mixer.com/Razakius to hang with me sometime! This one seems obvious to me, but maybe it isn’t to everyone else. But Chewy has made quite the name for themselves recently and have quietly carved out a chunk of Amazon’s business. For months, I have already been using Chewy primarily for all my pet needs. I buy cat toys, litter and food (both dry and wet). From Chewy, and I actually order pretty frequently because cats go through things fast. Truthfully, I’m not entirely sure why I’ve moved to Chewy but I have, and so has all my friends, and looking at the recycling bin when I’m throwing out my boxes, a lot of others have as well. Both Amazon & Chewy have similar prices on their goods. Both give discounts if you subscribe. Chewy gives free shipping at $49 and it is 1-2 day shipping. You can get these things next day with Prime but at $25 you get free 3-5 day shipping. I will say, $49 is a lot more difficult to attain than you might think. I usually hit like $43 with a huge bag of litter and 2 boxes of wetfood and then am struggling to figure out what to add to get the free shipping. The downside, I feel, with Chewy is that the boxes are heavy! They very rarely split those $49+ boxes, so you are lugging these huge boxes around, I have never ordered pet supplies from Amazon, but I am sure they have the same issue. What is starting to feel like a yearly return, I find myself once again back in the realm of No Man’s Sky. In a clear sign that Hello Games, and the gaming community, are more content with the game than early on, the second year only brought 1 content update, whereas the first year brought 3. I don’t entirely mind… diminishing returns and all, it’s the second year and while I am sure it sells a decent amount with each update, they probably sell fewer units with each update. I wonder at what point they decide to add an expansion or DLC, and I wonder how that would even look. But I digress, the latest patch is 1.5, nicknamed Next and it is kind of a doozy. Probably the #1 most requested feature was added… multiplayer. And I’ll be honest I don’t care about that one too much. It’d be nice to play with someone, but I don’t really have any friends who would play the game, and I don’t particularly want to get randoms. Even without the multiplayer, I felt it was a really big update. First off… the space things that they added. They added Frigates that you can hire that will fly around your freighter and give you defense power from pirates. But you can also now send the Frigates out on missions to get you resources and money and such, which is a nice touch. I have only marginally experience Freighters since the update and I do think the main pathway is less confusing than it was and the base building seems more sensical. Speaking of which, they sort of overhauled space stations. Now, instead of a couple of tunnels with tiny rooms, each having a couple of creatures. Now they opened them up and they include more creatures to interact with, a space suit customizer, shops, mission givers, and a teleporter. It feels a little more fleshed out which is appreciated. And lastly, they added ringed worlds. Yes, ringed worlds! I think they are a little more common than I’d like, nearly every system has at least one, but realistically they are pretty common in the real world. and they are gorgeous both in space and on ground. Speaking of Bases, they enhanced bases on the ground as well. They added new parts, and now you can build more than one base, AND you can build them pretty much anywhere, and they can be pretty large as well (they used to be limited to like 250 parts or something). I’ve seen pictures of people building bases under water, in cave systems, and even on crashed freighters. With this ability coupled with portals, I can totally see myself building a network of worlds that get me any resource I want and are beautiful. This has gotten me FAR more interested in base building than I was previously. 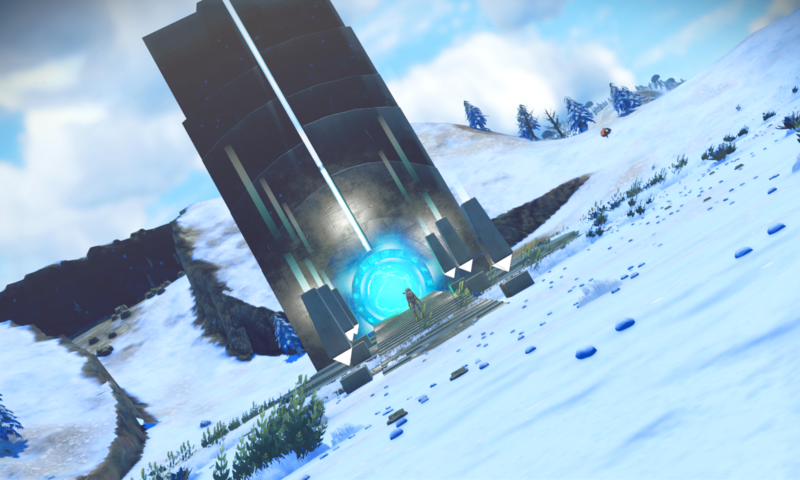 Previously, I was resigned to just build a base in my freighter, because although you could take a portal to the planet easy enough, I may as well take the base with me. Now I can do both. They renamed pretty much everything and re-working crafting as well. Overall, I think the name changes were good. I like that I need oxygen to recharge my suit instead of thaumium for instance. Overall, the materials seem to make more sense than they used to (Platinum is actually fairly rare, instead of growing out of plants!). I also think that the crafting changes were good as well. It added a real progression to crafting. You start by crafting in a portable refiner, then move onto Medium refiner, and finally heavy refiner. I haven’t gotten too advanced into crafting to get into the nuts and bolts, but on the outside looking in, it looks much better. They also made some tweaks to terrain generation. Overall, I think when people go looking at planets, they are much more appealing in general. I personally think that there is more variation in land formation. However, many people have noted that there is less variation in color schemes. Before you could find bright yellows and pinks all over the place, it was kind of like going to a world painted by splatoon inklings. And generally, this was more problem then good. People often complained about the eyestrain, so of course once they fix that people complain that there isn’t. Can’t win I guess. I will say, that I think the bigger complaint is that while all in all it’s better, people still want the occasional super bright colored planet. I’ve seen people complain that they only ever see red, green and grey colors, but I do get the occassional lush planet with blue grass and yellow & pink plants and it is marvelous when I do. I do think it happens, but it could probably happen a little more. They also took out the resource pillars that were common in the game previously, probably for the best, but I admit I miss the pillars sometimes. I like that they aren’t everywhere, but it’d be cool if every now and then you ran into a planet that had pillars of gold. I think the key point to take away is that what they were doing previously was only bad in its frequency, if they made them uncommon to rare planets, these things still hold a draw. Lastly, they added third-person view and improved graphics. It seems like every major release comes with improved graphics, and it is always appreciated because it makes a beautiful game even more beautiful. I really like the added third-person view (and the character customization!). I am not a huge fan of first person so this was a nice addition, though I do admit, it took a little time to adjust to targeting what I’m shooting at. I kind of wish they had character customization parts that you could unlock, maybe they do, or maybe that’s in the plans for the future. I don’t know. One thing I have to say, is that usually at about a month of play time the novelty kind of wears off and the grind gets annoying. So it will be interesting to see how that develops over the next couple of weeks. But an interesting point to note is that my last play through ended at about 20 hours. This kind of ended prematurely, I wasn’t quite bored of the game yet, but because my ship spawned in the ground I rage quit. In my current play through I am at 17 hours, and honestly I am getting more excited to play the game more as I go on. I have some neat plans that I hope to execute fairly soon <>. And I don’t think I’ve had this much excitement about the game in previous attempts this far into it. I feel as excited every time I sit down as the last and it is the same excitement I had before the game was released. Is the game perfect? Far from it, but this is pretty darn close to what I had imagined at launch. I look forward to seeing what Hello Games does in the next update because I honestly have no idea where they will go now. In 2016 there were 20,000 deaths attributed to Opioids. Funny thing about that stat. If someone dies to a heroin overdose but has an opioid in their system, they count the person in both categories. There were 15,000 deaths attributed to Heroin. Another interesting stat. There were 45,000 deaths that same year attributed to suicide. People with chronic pain are twice as likely to commit suicide than someone without chronic pain. Which means to say… had 30,000 of those people had access to Opioids, there’s a good chance many of them would still be alive. Now we are telling people with chronic pain that they should remain in chronic pain because some idiots overdosed… do you think the suicide rate will go down or up due to this decision? People have overdosed on things for decades… that’s not going to stop just because you make opioids harder to come by…. I mean a key point here is that 15,000 people died in 2016 due to Heroin. Is heroin legal somehow? What doctor is prescribing Heroin? People are dying from it nearly as much as from Opioids yet, it’s harder to come by even now than opioids. The worry that as I get older I will need pain relief more and using it now will desensitize me to the point where it isn’t useful in 15 years. This begs the question… how will I get to 15 years without it? If you really don’t want me to have opioids, then find me a real alternative. Not this Lyrica and Tylonel crap, that I’m sorry if you people think actually was going to work, you need to go back to school because I could have told you otherwise (and have). Why hasn’t CBD oil been put on the table? What about PAMs? Are any drug companies looking for human guinea pigs for pain drug experiments? If there truly is no other drug besides tylonel and opioids for pain, then we really need to go the route of opioids because that is the only option. I agree that doctors need to be more careful about who they give opioids to and why. But it’s darn right irresponsible to force a chronic pain patient into pain. Moreover, it’s just mean. I don’t know what I have done to wrong you, but whatever it was, I sincerely apologize for it. I would not wish this sort of pain on anyone I have ever met, I must have done something woefully wrong to warrant this backlash. Please stop punishing me for what others did with Opioids… it isn’t right. You are causing me a severe amount of pain, and I just can’t take it anymore. This needs to stop and it needs to stop now. I am begging you… help me. On Saturday, someone I had previously grouped with messaged me and asked me if I wanted to join this new raiding guild that was starting up. Now normally I would generally say screw off, and move along. But of late, I have been fairly unhappy with both the game and with our recent raiding alliance.